I’ve always loved a good deal. The sweeter the better. I love getting something for nothing or next to nothing. There’s nothing better! Way before the internet, I saved coupons, looked for deals, and trolled the sale aisles at my favorite stores. Though now I shop almost exclusively online, I haven’t changed. I still love a good deal. I search for coupon codes. Sign up for reward programs. Always choose the free shipping option. As Christmas approaches fast and furious, I’m in major “deal” mode. I’m hunting. I’m gathering. I’m searching. I’ll bet you are too. With budgets tight and many people to buy for, I need to make good buying decisions. Why pay full price when you don’t have to, am I right? This season I am more in need of a good deal than ever. With 2 kids in college, a middle schooler, and a kitchen renovation almost complete, I discovered Groupon Coupons in the nick of time. I know you know about Groupon deals for experiences, events, and gifts, but did you know that Groupon now has coupons? Check out Groupon Coupons. You won’t regret it. I’m discovering so much about Groupon Coupons! I’m hunting…gathering…searching…and finding many deals, coupons, and discounts on Groupon Coupons. Every day there is something new. Every day Groupon Coupons lists the Top Coupons & Offers. Each day’s Top Coupons & Offers can range from 20% of 1-800 Flower to a free iPhone 7 from Verizon Wireless to $30 Off $299+ Order of glasses from Lens.com and so much more. 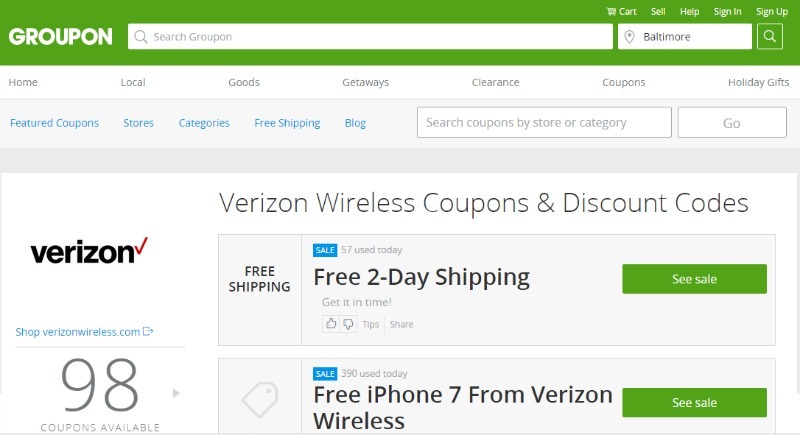 One of my teens has been asking for a new phone so Groupon Coupon’s Verizon page is coming in handy! Another teen needs new glasses so you know I’ll be using the coupons on Groupon Coupon’s Lens.com page! So many great deals. Too many to list. Check out Groupon Coupons for yourself!